RIDGEFIELD, WA. 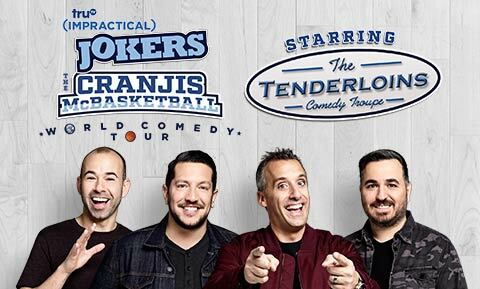 (February 04, 2019) –The Impractical Jokers “The Cranjis McBasketball World Comedy Tour” starring the Tenderloins will have the entire Cowlitz Ballroom laughing on the edge of their seats when they perform at ilani. The brand-new show starts on Sunday, July 21st at 7PM. You can reserve your seat on Friday, February 8th at 10am for $79 or $99 at ilaniresort.com and Ticketmaster.com Gear up for a night of ridiculous fun and laughter with Joe, James, Brian, Sal and the Tenderloins! An evening of pranks, laughter, and tears of joy as the “Cranjis McBasketball World Comedy” Tour hits stages nationwide. With a worldwide fan base, the Impractical Jokers have three sold-out nights at Radio City Music Hall, a sold-out Madison Square Garden, and five sold-out shows at London’s O2 Arena. The Impractical Jokers have experienced major success since airing on truTV. They are top 5 in their timeslot on cable in the US, and the #1 show on Comedy Central in the United Kingdom and India. The Tenderloins are sure to deliver a performance that will keep viewers laughing long after the show’s conclusion. Located on a 156-acre site in Ridgefield, Washington, ilani, developed by the Cowlitz Tribe and Salishan-Mohegan, a partnership that includes Mohegan Sun, one of the world’s foremost gaming and entertainment developers and operators, is the West Coast’s premier gaming, dining, entertainment and meeting destination. With nearly 400,000 total square feet, ilani includes 100,000 square feet of gaming space with 2,500 slots and 75 gaming tables; 15 different restaurants, bars and retail outlets; and a 2,500-seat meeting and entertainment venue hosting nationally recognized performances. For more information, visit ilaniresort.com and follow ilani on Facebook, Twitter, and Instagram.